Directions to Stop #5: Now you have a couple of choices. The easy way to get to the next tour stop is to back track to US Highway 69. Alternatively, you could head east on Xavier Road for about 1.7 miles until you reach Barnesville [ Waypoint = N38 00.469 W94 39.793 ]. Turn right (south) onto 245th Street. After one quarter of a mile you will cross the Little Osage River approximately where the Old Military Road crossed the river [ Waypoint = N38 00.252 W94 39.872 ]. Continue on another half mile and you will cross Rocky Creek [ Waypoint = N37 59.901 W94 39.661 ]. Then go about one third of a mile and turn right (west) on Wagon Road which will take you back to US Highway 69 (about 2.5 miles ahead). This tour stop is located near Fort Scott, Kansas 66701. Get headed south on US Highway 69 and after about 10 miles take the exit for Wall Street (US Highway 54). 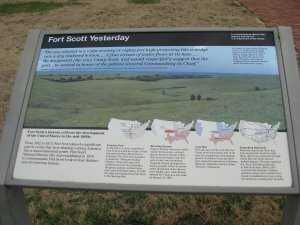 You will probably also see signs for Fort Scott National Historic Site. 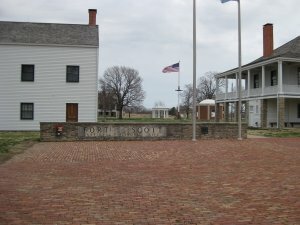 You will see the entrance into Fort Scott National Historic Site a block or two ahead on the right. Description: Fort Scott (named after General Winfield Scott) was established in 1842 as one of a chain of forts to help manage relations between settlers and Native Americans. The fort was used as a military installation protecting the Kansas-Missouri border during the American Civil War. Prior to the Confederate defeat at Mine Creek, Price had sent Brigadier General M. Jeff Thompson's Brigade from Shelby's Division ahead to attack the garrison at Fort Scott and capture the military stores and supplies there. 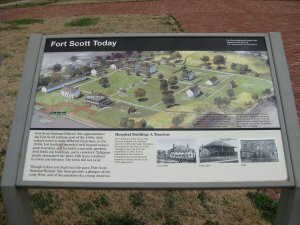 At the time, Fort Scott was only being defended by small garrison because many of its troops had been called north to defend against Price's movement from the east at Westport. Around noon on October 25th, Moonlight, who had continued heading south for Fort Scott, appeared on Price's west flank. Price decided to cancel the attack on Fort Scott and sent out Brigadier General M. Jeff Thompson's Brigade to drive off the Federals. Moonlight continued on and reinforced Fort Scott. Now Fort Scott was well defended by over 2,000 men and was safe from an attack by Price's army. After deciding to cancel his attack on Fort Scott, Price turned southeast to continue his retreat. Following the battle at Mine Creek, the Federals marched their Confederate prisoners to Fort Scott for internment and disposition.